Editor’s note: The following article was translated from French using Google Translate. The photo, below, accompanied the article. 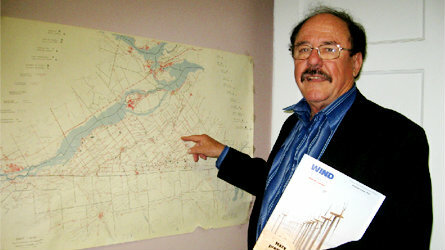 It shows the wind developer, Mr. Desgroseillers, pointing out where he had planned to build his “wind farm”—before the new law, passed last month, booted him out. 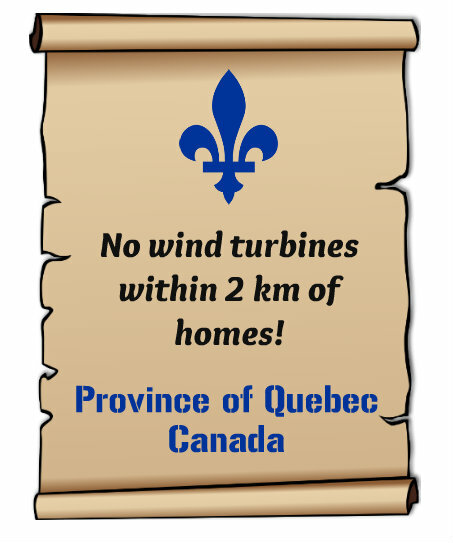 No wind turbines can be built less than 2 km from a home and 1 km of a road in the Haut-Saint-Laurent, in the Montérégie. The Quebec government has officially endorsed the amended interim control (RCI) of the Haut-Saint-Laurent surrounding these structures in its territory, which the council of mayors adopted on 9 January. The Minister of Municipal Affairs, Regions and Land Occupancy (MAMROT), Sylvain Gaudreault, approved the new RCI in a letter dated March 13. “The Regulation respects the policies of the government in terms of development. Therefore, under the Planning Act and planning, it shall take effect the day on which this notice is served,” the minister said in this letter for the prefect of the MRC, Alain Castagner. In the territory of Haut-Saint-Laurent, this revised version of RCI forbids the erection of wind turbines 2000 m (2 km) from any dwelling and 1000 m (1 km) from any public road. The new version of RCI also seeks to protect agricultural fields, cultivated floodplains, and woodlands, as well as bike lanes from the presence of wind turbines. It also establishes the 1000 m distance between the turbines and the Linear Park of the Haut-Saint-Laurent and 2000 m separating the site Droulers / Tsiionhiakwatha Saint-Anicet. “As a prefect, I’m glad that the RCI has finally been accepted by the Minister,” said the mayor of Saint-Anicet and prefect of the MRC, Alain Castagner, in a telephone interview. The prefect insisted that any wind farm developers in the region will meet the requirements of the new RCI. “The aim of RCI does not prevent the construction of wind turbines in the MRC, but establishes reasonable distances (setbacks) in an effort to protect the citizens,” he said. Godmanchester residents opposed to the construction of ten turbines in the municipality, warmly welcomed Minister Gaudreault’s decision. “I’m very happy for all citizens. This is very good news. People felt they were listened to by our leaders. 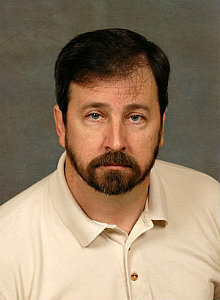 The minister’s response pleases us greatly,” said the spokesman of the group, Carole Trepanier. 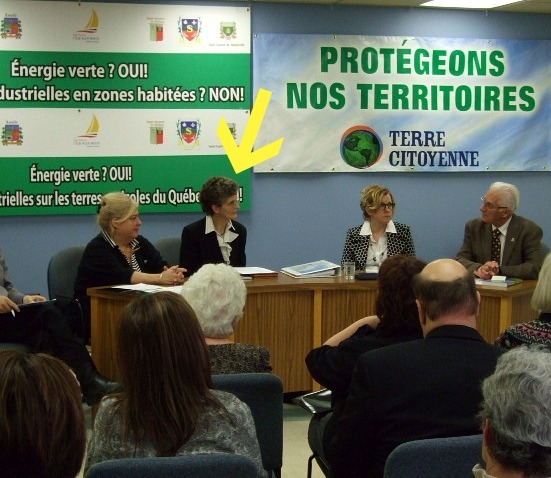 Ms. Trépanier recalled that in a letter sent Nov. 13 to Minister Gaudreault, she wanted to raise awareness of the mobilization orchestrated by those citizens who oppose construction of ten turbines in Godmanchester. “We wanted to persuade the government to be protect us from wind turbines affecting our health. We wanted to demonstrate that wind turbines in Godmanchester would have negative impacts on the beauty of the landscape and property values,” she said. Ms. Trépanier also pointed out that 570 people have so far signed the petition launched in recent weeks in the region against the construction of a wind farm in Godmanchester. “There was no community support for the project. Citizens have supported us in our efforts, because we educated them,” she said. The president of International Barter, Jean-Claude Desgroseillers, said he was disappointed by the acceptance of the new RCI by the minister, adding that such a decision would effectively block any future construction of wind turbines in the MRC. With this new version of RCI, the prefect of the MRC wondered if there are still areas of land in the Upper St. Lawrence where it will be possible to build wind turbines. “If such areas remain, they would have to be large,” he said. Editor’s note: Readers may not remember that Nina testified on behalf of this coalition of mayors—at their request. This was several years ago. See Pierpont vs. Big Wind Bluster (Québec, Canada) and “Vivre le Québec!” (Québec, Canada). Also note, 40 doctors sign Wind Turbine Syndrome petition (Quebec). Photos from Nina’s testimony in Quebec, below. If we here in Massachusetts had government officials with this kind of common sense, there would be rejoicing in the streets!! I will send this article to my state officials, but 90% of them are so deep into the Wind Turbine Industry’s pockets that they won’t be able to see well enough to read it….even if they wanted to. This is good, but we must do better! Local control is so important! Here in Maine, 40 communities have adopted wind power ordinances that are far more restrictive than the state’s “model ordinance.” There is a strong belief that all residents must be provided protection, that property values must not be damaged, and “Quality of Place” of a community or a region is far more important than the feckless wind power scam. It is very good, seeing this happen. I wish it could happen here (Amherst Island, Ontario). Unfortunately the provincial government and the wind companies are teamed up, forcing turbines into protesting communities with no regard for the safety of the inhabitants. 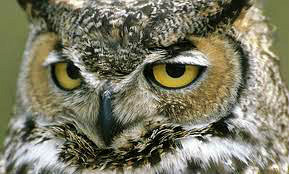 There is no concern either for internationally designated Important Bird Areas. We are one such area, on the migratory flyway of eastern Lake Ontario where they propose to erect a wall of turbines right next to our famed “Owl Woods.” It boggles the mind. If they have their way—putting turbines all around the eastern end of the lake—the cumulative effect will be to decimate the migrating bird populations. Just the prospect of the development here has wrecked our community. If you believe you have gained something by this 2 km. setback, you are wrong. There should be NO more Industrial Turbines built anywhere until the developer of Wind Turbines can prove 100% that Industrial Wind Turbines have NO ill effects on people, animals or the environment. You can see the bloody things over 20+ km away, and, as you now know, in Australia they can be felt over 10 km. away. 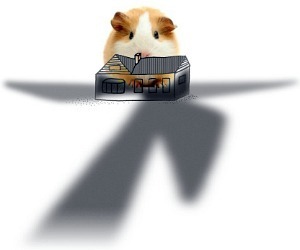 Stop all development until all research has been done and let the developer prove they are reliable, cost-effective, and have no ill effects on the planet. They won’t be able to demonstrate any of these things. NOT GREEN, NOT CHEAP, NOT RELIABLE, and have very BAD side affects, to people and Nature. It’s a start! On what grounds are they saying minimum of 2 km? Are they acknowledging the health effects from these things, or simply imposing rules that make sufferers feel as if they have been listened to? All the same, this is a great for Quebec. As Andreas says above, there should be a worldwide ban on these things (including ones already sited) until the wind conpanies can prove with certainty that there are zero problems caused to the environment, human and animal health. Of course we all know that if they ever did that study, they (the wind conpanies) would be screwed. Is there anywhere right now that we can make sure we have the effects logged, as I can see a huge amount of compensation claims being made once it eventually comes out? (And it will, eventually.) Also, perhaps if the wind companies were aware of this, I’d expect it to affect how and where, or even whether, they decide to site or operate any more of these things. Editor’s reply: The 2 km setback was likely based on Nina Pierpont’s testimony. See the reply I gave to Jackie, above. (The first comment in this series.) Since Nina did her seminal research for her book, an overwhelming amount of evidence has shown that in many places 2 km is woefully inadequate. This is the case in Australia, for instance, and it seems to be true in the American Southwest. In Australia, Nina suspects the Coriolis Effect is coming into play. She bounced this idea off physicist Dr. Malcolm Swinbanks (PhD Cambridge Univ) several years ago, and he thought it had merit. She asked Malcolm to work out the mathematics of it vis-a-vis wind turbines, but he was too busy to pursue it. There is also the matter of landscape affecting turbine ILFN (infrasound & low frequency noise). 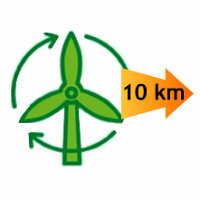 That is, how far turbine ILFN will travel, depending on topography. Nina explains this in her book, though she doesn’t get into the Coriolis Effect, since, when she wrote her book (2009), the evidence from the southern hemisphere was skimpy. As for effects being logged, visit Ill Wind Reporting. The ordinance is adequate so long as it prevents the project from going up. In my township, we have an ordinance stipulating a setback distance from “non-participating neighbors” of 3000 feet. The distance is not sufficient to protect health. But it has been sufficient to put BP’s plans on hold. (Editor’s note: BP is the wind developer.) We’ve had this ordinance in effect now for two years. BP had been moving forward, full-tilt, to erect a 100 MW project. It is now on hold. The setback was sufficient to stall the project. We also have a rather strict limit on dbC and all kinds of requirements to measure ambient sound prior to the project. You may know that BP is in the process of selling all its wind assets, to get out of Big Wind. So just last month, they approached my township, again, in a letter requesting a “reconsideration” of the ordinance. What did BP want? They wanted the original ordinance, which had been amended, two years ago. They wanted 800-foot setbacks from property lines and they wanted 55 dbA at property lines, with no measures of dbC. Ludicrous! 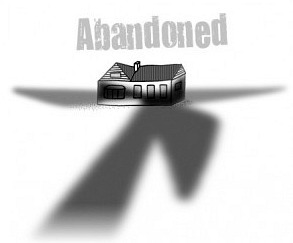 They wanted the township to revise the ordinance so they can sell the leases more profitably. 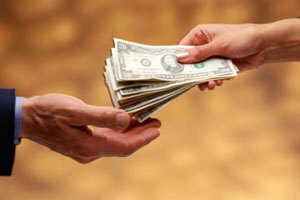 BP will be unable to sell the leases to a new company, or they may not get what they paid for them. I remain vigilant, though, because at any time the state legislature could develop a bill to do away with local control. Local control is the only hope we have to keep Big Wind out of our communities. And even with local control, good ordinances seem to be the exception, rather than the rule. There are simply too many bozos out to serve their own interests, at the expense of their communities. It is heartening to see so many good points made here in both the article and the comments! I am greatly encouraged and my spirit bolstered that REALIZATION IS GROWING: the pervasive pernicious effects of Industrial Wind Energy are NOT limited to within 2 km of IWTs! Wipe Industrial Wind Energy from Earth! Dismantle IWTs Across the Globe! However, my reaction to the news from Quebec is, although I emphatically agree that 2 km setback is woefully inadequate, it is a move in the right direction. Because, I know it was a hard-fought battle to even achieve that distance. I know how hard it can be, from our battles here in Arizona, to get past that 2 km “standard.” When local officials realize they are losing the battle for setbacks within blade-throwing distances, they grab and latch-onto the 2 km “lifeline.” They don’t want to hear the later proof testifying to its inadequacy. 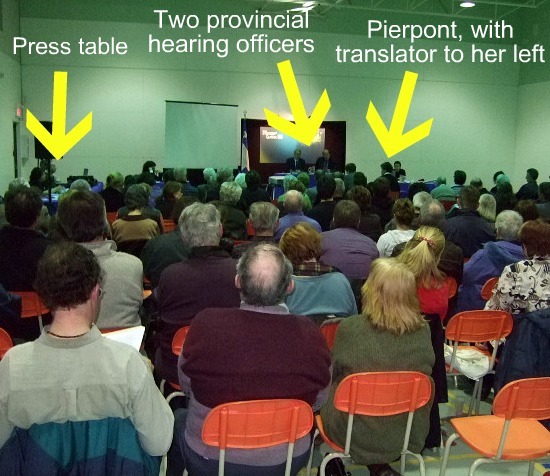 They don’t even want to hear that Dr. Nina Pierpont did give a RANGE as the suggested setback minimum! When our county supervisors finally accepted the concept of going beyond the developers’ standards based-upon 110% times the length of a blade, it was extremely difficult to get them to go farther than one-half-mile. Every positive achievement in the War Against the Wind is a step toward the Ultimate Victory over the evil spreading IWTs across the Face of Earth. This 2 km is a chink falling from the Armor of Governments Against Reason! It is a cut sliced into the body of Industrial Wind Energy. Death to the Enemy by a thousand cuts is preferable to no death at all. The bull begins to die as his lifeblood seeps from the torturous stabs of the poisoned weapons of the picadors long before the flashy matador sinks the blade into his body. I rejoice over this small victory, it is a beginning for Quebec! And Canada! The Ontario Liberal gov’t must start listening to the facts that other jurisdictions are discovering. Unless there is criminal activity on the part of the Liberal gov’t and the wind turbine companies, which I suspect, they will have to change the setback distance in Ontario. They can never continue to allow turbine construction and say they were not ware of the damage to human health. Like Andreas, I would prefer not to see turbines anywhere because I believe they will create ecological dead zones wherever they are erected. As Dr. Pierpont has pointed out in her book on WTS, even the lowly codfish has otolith organs. This is to say nothing of dolphins, whales, or humans. Unless I have missed her point, pretty much anything that walks, swims, or flies is susceptible to the destructive force of infrasound produced by wind turbines. That is how living things have evolved. Still, it is extremely heartening to see glimmers of rationality, sanity, and hope. I recently read a study on pain research that shows human pain can be reduced by as much as 30% simply by acknowledging and believing the person who is in pain. Yesterday, a Fairhaven selectman apologized to Karen Isherwood, one of the wind victims whom I have written about in these pages. He promised to seek mitigations. He recognized her suffering. It’s not enough, but it’s a start. The U.K. has banned any new land-based wind farms. My fearless and tenacious friends in Falmouth, MA have brought their town to the brink of being the first in the country to dismantle operating turbines–even at the town’s expense. The battle is not won; but, slowly, the tide seems to be turning in the right direction. That is something to be applauded. I applaud the Quebec government for listening to its citizens. Unlike Ontario, Quebec did not dismiss medical evidence, took the precautionary approach and did not suggest that sypmptons were all in our heads. I also applaud the Quebec Government for people first rather than the big money wind industry.